Have you had an opportunity to test the 2012 version to see if there has been a change to the setup of classes and equity account for restricted accounts? Our church has an existing Software accounting package. Blog comments suggest that one starts from zero balances. Is there a way to export/import our chuch financial history into QuickBooks? Yeah you can do that. It’s a bit of work and you’ll probably want to work with one of the experts at QuickBooks to get it done (or someone else who has done it before). I really appreciate the QBs Church Accounting Course. I love your writing style as well. I am new to QBs as I have used MAS 90-2000 most of my career as a controller, plus I have been out of the game for 7 years now, so I am really in need of a refresher. I find that QBs has a lot of wasted fields in regards to donors (customers as QBs calls them) and I can’t find a way to input a husband and wife together as donors. I purchased another software from StartChurch to print out the year end documents easier, but I do have a question. Question: Our church is brand new. I bought QB for non-profits 2012. Our first tithe check is what was used to open the church checking account. The check was deposited on 8-8-12 and the checking account was open on that date. How do I log this into QBs? When it asks for the opening balance for the checking account, what should I input since I also have to record the donation as well? I haven’t really started to use QBs as yet, so I am really in need of this course and I thank you for putting it together and your expertise. I just purchased the course yesterday. Thank you for your time. Great question. I’d recommend reading Book 2 of my course. Lesson 26 (members only) will be especially helpful for your question. The short answer: It’s better for documentation purposes to start with a zero balance and then enter the transaction using the ‘Donations’ icon. our church uses power church right now but i am looking for something a little more user friendly. My main question at this time is we are partnering with another 501 (c) (3) and i am going to be having to keep two seperate sets of books and need to know how easy it will be to set up to seperate sets with this software. Also customer support, how long would I have it does it cover just software issues or is there help with set up. I will take the online course if this is the way I go. 1st Question: It’s really easy to run two different sets of books using QuickBooks. You just set up two different churches and then when you open the software you sign in to the church you want to work with. You can sign out of that church at any time and sign in to the other nonprofit organization. 2nd Question: QuickBooks comes with free installation and set up support. However, that really just covers installing the software. Getting your QuickBooks accounting system set up correctly is covered in my course. Creating a chart of accounts for churches, fund accounting, entering transactions correctly, reporting, and much more are covered in the QuickChurch Accounting course. You can also get continued technical support from QuickBooks called Care Plus. That includes 24/7 phone support. It costs $30 a month though so it isn’t cheap. 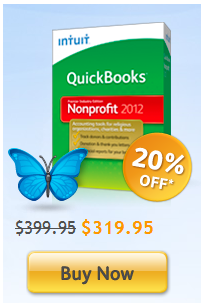 I’d recommend buying QuickBooks Nonprofit and the QuickChurch Accounting Course. You can always ask me questions inside the course. I’d say Care Plus is probably overkill in most situations (I’m biased of course). We talked through email but I thought it would be great to put some of the information here for other people to see. The QuickChurch Accounting course that I created is really designed to help you know exactly what to do next. It starts with installing QuickBooks and setting it up for your church. Then it shows you how to set up a chart of accounts (it even gives you a great chart of accounts that will work for most churches- all you have to do is import it and the course shows you how to do that). Then it shows you how to set up funds. After that we work through 18 common transactions together. By the time you’re done with the course you’ll feel quite confident with QuickBooks Nonprofit. But perhaps the best thing about the course (in my humble, but biased opinion) is that if something isn’t covered, you just send me a message and I won’t rest until I figure out how to do it (okay slight exaggeration there). I really do appreciate it when people send me questions and feedback though because it helps me make the course even better. @doups3: I have QB Pro (2010) and just like Marsha all I can find is payroll online that charges. When you state standard payroll are you talking about you doing payroll in QB and completing all the reports yourself? Or does standard payroll in QB fill out the forms when you enter payroll? Every time I have tried to go to the employee center for payroll all I get is them sending me to the online charging payroll. We only have 2 employees and I can’t see paying $23 a month for 2. Yes I see now that QuickBooks is funneling people towards the online options now. Here’s a post I just made for how to turn on Basic Payroll. Or you can go here for the basic payroll option http://payroll.intuit.com/payroll_services/basic_payroll.jsp (the cheapest). When you purchase basic payroll or enhanced payroll they send you a key and a download that will allow you to use the payroll option for a year or however long you purchased the license for. For you (with only two employees), the basic option would only be $9 a month or $108 for the year. The basic option helps calculate taxes, but it doesn’t fill out the quarterly and annual forms that you need. You’ll have to fill those out by yourself or with an accountant. The enhanced version does come with these forms. If you’ve done payroll in the past then these forms aren’t difficult to fill out. If you have the time and want to save the money then I’d go with the basic payroll option. Payroll is kind of a sliding scale: You can pay a lot and have someone take care of your payroll for you (no time). You can pay for the enhanced version and spend a medium amount of time. Or you can pay for the basic version and spend a bit more time. Thanks, Nate. I’m not sure why this person thought this was true, but am happy to be able to consider another direction! I will be taking over the financial responsibilities from the person who has done our church books for years. Currently we use QB Pro and standard QB Payroll. She has done a good job setting up classes, etc. We also use ServantKeeper, though not to it’s full capacity. After reading much of the above I am more inclined to pursue the possibility using of 2012 QBNP, though I am being told if we do so, we would not be able to use the Standard Payroll any longer, but would be forced to use QB online PR, yet another increase in cost. Is that correct? Who is telling you that you’d have to use the online payroll? I’ve never heard that before. I just went to the QuickBooks site to see if I’m missing something, but it looks like you can still use the basic payroll to me. Here’s the page that compares all their payroll products: http://payroll.intuit.com/compare/compare-quickbooks-payroll.jsp. For each edition they offer your standard payroll and then an online version. QuickBooks Premier can do everything that QuickBooks Pro can and then some. It’s a step up from Pro if that makes sense. It can do everything you’re talking about, but there is a bit of a learning curve. As always, I’d recommend getting “Running Quickbooks in Nonprofits” By Kathy Ivens and then getting to work! My church is switching to QB online this year. My job is to figure out how to easily generate year-end giving statements. By the comments above it looks like there is not an easy way. My hope is that I don’t need an additional software for this. If I enter each tithe/offering as a sales receipt, isn’t there some statement I can customize to pull these for each customer/donor? Our small church has been using CDM+ since 1996 (from Ver.6 to Ver.9) mostly for accounting, contributions, & limited membership usage. Unfortunately, like our cell phones, the software has gotten much more complicated over the years. I agree with Bob (above) that CDM+ has become “too difficult for most lay people”. As the financial secretary, I’m looking at a change to QB NP and Servant Keeper. The Servant Keeper format appears to be as simple as the old CDM+ Ver.6&7. I’m hoping that the 80-90% popularity of QB is justified. I need programs that don’t intimidate & scare off my helpers. I agree with you that some of these programs are getting way too complex. The goal is to meet all the needs of the church while providing the simplest solution. It’s not an easy tasks as the filing requirements for churches continue to get more complex. I don’t think you’ll go wrong with the QB and Servant Keeper combination. With that in mind, there will still be a bit of a learning curve that you and your staff/volunteers will have to overcome. I recommend reading that QuickBooks for NonProfits book by Kathy Ivens. Make sure you get the updated 2nd edition. It will answer a lot of your questions. I am currently using QB 2004 Basic running on Windows XP. We just purchased a new computer at the church (windows 7) and I am needing to buy a new version of QB (looking at QB 2012 for NonProfits). Will my data transfer into the new version? Data transfer can be tricky. I’m not exactly sure on your transferring from 2004 to 2012. I think you should be able to do it, but I’d ask the people at QuickBooks first. Sorry I wasn’t more helpful. That really depends on what you’re looking for. I think QB will be a much better option for the accounting side of your church. Membership Plus would be more helpful for managing the members of your church. Unfortunately with both pieces of software you are going to have a learning curve. I’d probably just stick with QB at this point and then purchase a QuickBooks for Nonprofits book from Amazon. Does anyone use ChurchWindows? Does it integrate with Quickbooks? Do you have any pros/cons about this? Bookkeepers for churches that are required to maintain designated fund balances and/or restricted endowment type of fund balances will find quickbooks to be very cumbersome to use. In this case a bookkeeper must know how to use quickbooks “classes” and know how to prepare “dummy account” adjusting entries to close out the net income from each class (fund) to the correct retained earnings account (restricted net assets account). Further, an understanding of the reporting requirements of SFAS 117 is necessary should the church want its books kept in accordance with Generally Accepted Accounting Principles (GAAP). The above process is “doable” in quickbooks but many, many church bookkeepers find the process unfathomable. I am currently using QB Pro 2010 and planning to upgrade to QB Premier 2012. Back when I purchased QB, I was already familiar with the program from using it in the business world, and from what I researched, the NonProfit version doesn’t do much differently except change the labels on things (i.e. Customers are called Donors). If you ever might have a secretary/treasurer/accountant who has used QB in the business world, I wouldn’t even bother with the nonprofit version, but it might be easier to understand the terminology and report titles if you have not had other business accounting experience or training. I highly recommend Kathy Iven’s book for nonprofits, although it doesn’t cover all the bases for church accounting. I set up a chart of accounts with income and expense accounts for our various departments. Some items, like FUEL, have only one expense account, but I use classes on every transaction to separate my various funds: General Fund (which pays administrative and facility costs and anything else not paid by a special fund), and Special Funds–Youth, Building, Missions, Benevolence, Christian Education, etc. Special Funds are any groups that receive and spend designated monies. Each of these, including General Fund, has its own class and some have subclasses. In addition, I have set up Equity accounts to show the balances for the General and Special Funds. If you use the UCOA, Retained Earnings is 3200, and other Equity Accounts should be in the 3200s. At the end of the year, Retained Earnings on QB will automatically show a balance if you haven’t transferred money to equity accounts. You know you have calculated and transferred monies correctly after there is nothing showing in Retained Earnings. If you have a Pro version or a pre-2011 Premier version, you cannot run a balance sheet by class, which is very frustrating, but you can still run a P&L by class and transfer starting, income, expense amounts into an Excel spreadsheet to calculate a closing balance per fund at month end. Our church doesn’t have pledges, so I’m not sure how to handle those, but I know Ivens explains it in detail. I handle all donations as sales receipts and track each donor as a customer. If we sell items via fundraising or accept money for conference or trip costs, I input those as invoices. I customized an invoice template and changed “invoice” to “payment reminder,” and I pass them out to members who either still owe or mark them paid and give when people pay for merchandise or other non-tax deductible items–basically, I use invoicing for all income that isn’t tax-deductible. I’m not sure if that is what you would want to do with pledges, but it works for my church, since we don’t have pledges. It’s a good way to see who still owes what, yet it’s easy to filter out invoices if I want to generate a giving statement. You can also create a clearing account thru which to process credit memos to clear invoices at year end if someone doesn’t pay a pledge. Giving statements on 2010 are unwieldy at best. From what I can tell, they made improvements to that on 2011 and 2012, but we’ll see. Last year, I was able to run a report that contained mostly the data I needed and then export that into an Open Office spreadsheet and spruce up the formatting to look attractive and comprehensible. I hope something here helps someone. I know it was a huge headache for me to set up, and I had prior ledger fund accounting experience as well as business QB experience. Still…QB is about the best bang for the buck available. @Rebecca, Thanks a ton for leaving that massive comment on the site. Please feel free to come back and let us know your thoughts on 2012, seriously. Rebecca, Thank you for such a specific and comprehensive review! You described some solutions I was looking for and helped me make the jump to QB NP. Doup3, thanks for this websote and your services too. I appreciate the extra resources. We are currently using CDM+ which is too difficult for most lay people to use. Can we transfer our data to QB? Does QB have the membership and directory info? @Bob. QuickBooks does not have a membership and directory management tool like a church management software program would, but it does have some tools to keep track of people. Where can I buy QB Premier and what is the cost? I am setting up books for a new small church. @ Nancy, QuickBooks Premier is normally $399. It will be $320 if you click through one of the links on my site (because I am an affiliate they allow me to give a 20 percent discount). How easy/hard is it to convert from a non quickbooks program to quickbooks non profit? it would be used only for accounting, we use a different contributions system. The answer to your question is famous among us accountants: it depends! The truth is it should NOT be difficult to convert over. QuickBooks has a free downloadable program that will help you convert from other popular accounting software programs. They also have a host of guides and tutorials to help people convert. Just Google “converting to QuickBooks” or “how to convert to QuickBooks”. Don’t get me wrong, converting isn’t always enjoyable, but one of the things I like best about QuickBooks is that so many people use it you can almost always get your questions answered. In other words, if you run into a problem, chances are a thousand other people have had the same problem and they know how to solve it. The current version still doesn’t have permanent and temporarily restricted accounts. You still have to do a bit of a “work-around.” I’m planning on purchasing the 2012 version and testing it to see if they have solved this. It just barely came out, so we’ll see. I’m crossing my fingers. That sounds like a good combination. I don’t know if you need Membership Plus just for contributions though. Membership plus will be helpful for managing your church members but you can manage contributions in QuickBooks (although it does take some jimmy-rigging as Chris mentioned). If you are set on some church management software then I would recommend going with a Servant Keeper/QuickBooks Combination. Yes you can transfer. There is plenty of support at QuickBooks to help you get this done. I should mention that QuickBooks nonprofit still requires a little bit of jimmy-rigging. You can buy a book by Kathy Ivens called “Running QBs for NonProfits” to get some help. I’m thinking about coming out with my own tutorials as well. Our church has approx. 100-125 active members. Looking to get new financial software and contribution program. I am considering getting QB Non-profit for financial use and Membership Plus for Contributions. Does this seem feasible? Any suggestions? Thanks. I dont see anyone touching on the topic of resticted funds or fund accounting with this software. I think the setup of classes and exquity account for restricted accounts is not the easiest way to do this. We run version 7 for no profits, but I do not like it. Is the current version set up for fund accounting or is it a workaround like version 7? There are some DVD and books available for your reference in market. You need to understand and follow SFAS 116 and 117. You are correct in the QuickBooks Pro does not work for non-profits. I have tried, and although it works fine for standard accounting entries, it does nto recognize the word donor, donation or give you the ability to put together a list of donors, or the year end statements. It is stuck on customers and invoices. I did not know until I reas the above that QuickBooks had a separate software package specifically directed at non-profits. I will indded inquire more about it. Thank you. Glad I could help. The non-profit version comes in the Premier version. When you are installing it, you select that you are working for a non-profit. I’m not sure who set up QB for my church I used to do bookkeeping for, but at the beginning of the year we entered pledges as invoices. Pledge contributions were recorded as payments against the invoice throughout the year – if they gave more than that, we created another invoice each time. All other donations (for missions, etc) were recorded as sales receipts for the particular fund, although after reading this informative website I think we were not following proper fund accounting procedures – we were entering them as liabilities. We also had a hard time with preparing reports – we exported to excel and reformatted them there. It was time consuming but we didn’t know any better! I have noticed that several comments requesting input concerning contributions, pledge entery and monitoring, and statements often go on without responses. If I choose to use QBNP do I need to marry this with another membership software? Great question. I guess you have to recognize the different purposes of the software. QuickBooks is used for your church’s accounting. 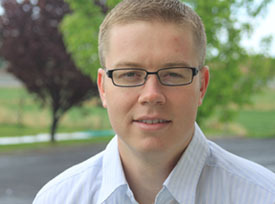 A membership program is used for managing your church’s members. They really have two different goals. Some programs like Servantkeeper and IconCMO integrate really well with QuickBooks. Keep in mind that a lot of churches are successfully using QuickBooks to manage their contributions and accounting. 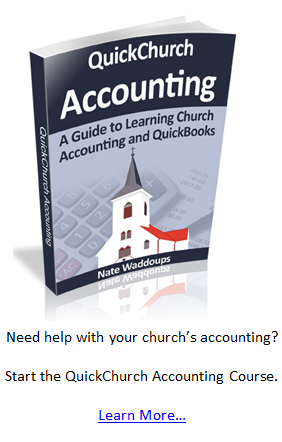 In fact according to the statistics I’ve read, a large majority of churches use QuickBooks for their accounting. I find it interesting that in this post and in the comments there is no mention of the regulations that churches should be obeying for accounting. In particular the FAS 95 and 117 guidelines that are set forth by FASB (Financial Accounting Standards Board). When these are reviewed many will come to the realization that many software programs do not adhere to these regulations. An all encompassing system would be able to provide fund accounting reports like balance sheets by fund, by all funds, or by certain funds. This is an absolute requirement that many programs can not provide. In addition all accounting reports including PL (statement of activities), cash flow reports, change in net assets, etc have the same requirements. Non-profit reports are even named differently than the for-profit industry – For example PL in the for profit industry = Statement of Activities in the non profit industry. Balance Sheet in the for profit industry = Statement of Financial Position in non profit industry. This is yet another requirement as seen in the regulations as well as having the ability for a Cash flow report. Additionally some software will try to run the funds through the liability accounts. This is unacceptable as well because funds are not liabilities. Funds in the non profit industry own everything because there are no owners in a non-profit organization. This is not to say a fund can not have a liability however you can not use the liability to track fund balances. In essence the closest thing you could compare a fund balance to is owner equity in a for profit system that tells you what is left over after everything was accounted. I took over the accounting function for the church in September of last year. They had purchased prior to me coming to work there Membership Plus. I worked with that until the new year and insisted that I purchase a good accounting system, I them purchased QuickBooks Non Profit. I am happy accounting wise but as far as the contributions and quarterly statements I feel that it leaves a lot to be desired. It seems very time consuming putting in the donors as “customers” and having to produce an invoice to record the donation. Also I have been unable to figure out how to put in the “pledges” into the system, does anyone have any suggestions? Thanks. I love using quickbooks for my church. When I got put into the finance office we was not using it. We have just started using the program back in September 2010. Ever since than I have been able to get my pastors quick reports and save money. I’ve been using QuickBooks Pro for small nonprofits for over 10 years. I’m happy with most of it. * You can’t easily open and toggle between lots of windows in the online version; I find that inefficient particularly when I’m researching balances or transactions. * The “find” feature doesn’t seem quite as robust. * The reports are different in the online version; for instance, it doesn’t have a payroll summary report that gives totals and detail. * The presentation of reports is a bit awkward, making it impossible to see row titles when you scroll right. * You can’t easily replace memorized reports. * You can’t arrange the chart of accounts as you’d like; it’s only alphabetical. * There are almost no keyboard shortcuts; it’s very mouse-dependent. * Navigation and selection within transactions is not very easy, particularly when you want to copy field contents to another line (an account name in a large deposit or a memo in a journal entry). I will be taking over as Church treasurer at the end of May [official change over]. Can you provide me with a guide or something? I would appreciate info on this. system. We do not use the Non-Profit edition because we could find no good reason to do so. Our church is not required to file a 990 or 990-EZ form. We do not use the class code feature in QB because our non-numerical chart of accounts is set up to clearly identify and control all of our Funds and Departments without that code. We use many of the QB Pro reports. For the very few additional reports that unique to churches and fund accounting we use a Microsoft program. What does the 90% know that we don’t know? Your combination of software sounds excellent to me (it’s practically what I advise to anyone who asks) . I meant for the post to say that this CPA believed that 90% of the churches out there are using some form of QuickBooks (whether it be the nonprofit version or the Pro version). I still think that the nonprofit version is a bit better for churches, but the Pro version will work in a jiff). In fact, I’m finding that more and more people are using the QuickBooks Pro online version for their church’s needs. Online software definitely has its advantages. My main concern is with membership contribution and for tax purposes. I want to know if there is a function within QB non-profit, that allows us to give/print out a receipt of their contribution each time after a donation ($ value) has been made. At the same time, will be keeping a profile of each members and their donations to-date or this year?? We are taking over our church’s finances this year. Two programs are currently being used: Membership Plus 6.0 (to track contributions and print our year-end statements for tax purposes) and Money Counts 9.0 (to keep track of the checking account transaction log). Can QB for non-profits combine these two for us? Can you print checks from QB? We show where our finances are going every year to the congregation with a very easy report. Can QB do this as well? Any feedback would be greatly appreciated. Yes Quickbooks does employer reports and all w-2s, w-3s, and 1099 including 941. It’s a wonderful product I have been using this for years. It does all that and more. It’s well worth the money spent. Does QuickBooks Non Profit have the capability to provide us with our monthly Employer reports including the 941 quarterly, and the year end work that we need to do W-2’s & 1099 MISC forms. I am researching different software that would be budget friendly. We have been using Quicken (not QuickBooks) for several years at my church because of its ability to track our investments. The last I knew, QB did not have this feature. We operate on a cash basis. I bought this software years ago and did not have an accountant set it up for me and kind of messed the whole thing up ended up returning it. Since then I have used regular QB for my small business and once it was set up by the accountant from the start, it is fairly easy to work with. So I am considering giving the NP QB another try. I have not been able to find the answer for is will I still need and accountant at the end of the year to file my return for my charity? I am required to send in a 990-EZ return and have to pay the accountant so much money to do it every year, it sometimes makes me question the economic value of maintaining the 501 status. Any advise on if the NP QB if set up properly would take care of the 990 form? Thanks for sharing your experience. You bring up a lot of good points. The truth is sometimes it is a really good idea to have someone who knows what they are doing set up the accounting system for you. Once it is set up and they give you some basic training, most people can handle the accounting from there. That’s the great thing about this software, it is pretty user-friendly. As to your question, yes the NonProfit Edition takes care of the 990 form. Hopefully this is some good news for you and it will save you some money. You still may need some help from someone with experience to fill it out the first time or two. Is the non-profit option available through QB Pro or only through the Premier edition? This would be our first time using a software for our church so I really want something that is easy & cost efficient as well. The non-profit option is only available through Premier. That being said, some people do use the pro version. It is just a bit more work because you need to know how to manipulate the pro version to fit with your church accounting system. Our church is considering QB for non-profits. What are your thoughts on the best time to switch over to a new accounting software like QB from another program if our fiscal year is different than the calendar year? Seems like we need to start at the calendar to track contributions and payroll but at fiscal year to track spending/budgets. This is an excellent question. I’m not sure there is a right answer. Either way you will have to make an adjustment. I personally would prefer the calendar year changeover date, but that’s just because I’m programmed that way. I am looking to get Quickbooks for our church. Should I only consider the Quickbooks non-profit edition or will I get the same capabilities in the Quickbooks premier or Quickbooks online? Your questions is a good one. This can be a bit confusing. First of all, Quickbooks Premier has the non-profit edition built within. You just buy the Premier version and then select the nonprofit edition when you are installing the software. QuickBooks online is great, but it doesn’t have the nonprofit features yet. I’ve asked them and hopefully they get around to that sooner rather than later. Marcie, you can prepare financial statements that look exactly the way you want in Intuit Statement Writer. It is excel based and works very well. I have been using it to prepare financial statements now for about 6 months. I love using quickbooks for the bookkeeping for my church, however, my biggest drawback is that quickbooks does not allow for easily preparing end of year giving statements. I can’t just click a few buttons and print statements like I can with most reports. It requires exporting data to excel and then preparing the statements from there. If anyone has an easier way, I’ld love to hear about it. QuickBooks is still the best option out there for non-profit accounting in my opinion. Besides the audit trail being improved, a closing date can be added and a password that once the books are “close” for a period (a month quarter, or year) they can not be changed without the password that the accountant sets. In addition QB tech is excellent it is obvious that the author has not contacted them based upon his comment that they are “probably” excellent. As of the latest survey 80% of all non profits which includes churches use QB in my experience the rate for churhes is closer to 90%. Having worked with QB since 1995 changing over churches from hand records to other software I find that other software without a real accountant to use it causes more problems that it solves since fund accounting is not longer GAAP. As for the disadvantage that you listed, you are mistaken. QB has an excellent Audit Trail that I, as an Accountant, use very often. It allows me to see what user (assuming you have logins) made ANY change to a transaction. This can be done on a daily, weekly, monthly or yearly basis. The report provided is very easy to read and I would highly recommend use of QB. I’ve had several people mention the audit trail is much better. I’ll update the post. Thanks for commenting. Just want to inform you that the major disadvantage that you gave for quickbooks is not true. QuickBooks has a wonderful Audit Trail which track all changes made to transactions. It gives a report of all changes, indicating what the original transaction was, what it has been changed into, who changed it and when it was changed. Thank you.